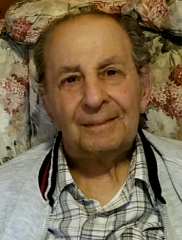 Fred J. Moussally, of Dedham, passed away on October 1, 2018. He was 97 years old. Born in Boston, Fred was a longtime resident of Dedham. He was very active in the Knights of Columbus and the Senior Citizens of Dedham, playing Al Jolson in a production put on by the group. For years, Fred helped Camp Dennison in Carver, a camp for inner city kids and was also a member of “The 83 Club,” a private club made up of several of his friends. He loved gardening and spending time outdoors. He enjoyed music of all kinds, specifically big band music and Frank Sinatra. What he loved above all else was spending time with his family. Fred was the dear and devoted husband of Laurice (Homsey). Loving father of Donna Willis of Dedham, Joan McInnis and her husband Warren of FL, Audrey Serrecchia of Onset and John A. Moussally of Norwood. Cherished grandfather, “Pa” of Sharon Flanagan, Christina Macieira, April Burby, Brian McInnis, Nina Waddell, Andrea Willis and Camille Serrecchia. Loving great-grandfather of Brittany, Brayden, Carmine, Calen, Aria, Hayley and Shane. Visiting Hours will be held Saturday 11 a.m. - 2 p.m. at the Kfoury Keefe Funeral Home 8 Spring St. (at the corner of Centre St.) WEST ROXBURY. Relatives and friends are respectfully invited to attend. At the sincere request of the family, please do not send flowers. Contributions in Fred’s memory may be made to St. Jude Children’s Research Hospital, 501 St. Jude Place, Memphis, TN 38105.